I admit, I have a chocolate addiction. But I blame it on all these startup companies making superior, super tasty, small batch chocolate with stellar packaging. And fyi, any candy bar made with dark chocolate, candied ginger and popping sugar is instantly put in front of a cash register along with my debit card. I can't fight it. John Eric Battles grew up in a small Alabama town but after moving to Charleston and working in restaurants, he decided to try his hand at making chocolate. His truffles were featured on the dessert menu at EVO Pizzeria and then, with more and more positive feedback, he was motivated to start his own company in 2008, aptly named Sweeteeth. By far, John's biggest seller is his Sea is for Caramel bar. 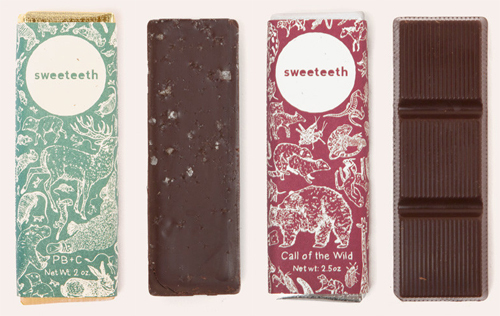 I had the chance to grab one of these at Star Provisions in Atlanta and I swear, this candy bar stops you in your tracks. 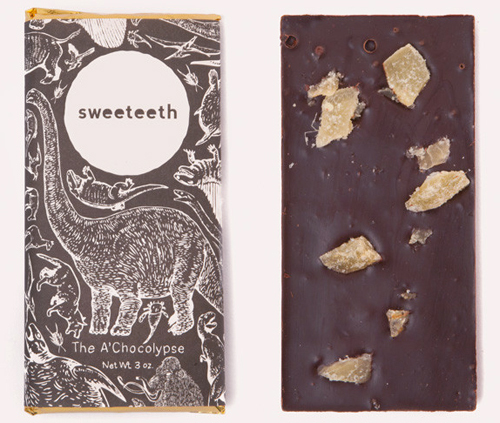 It's just the tastiest combo of 65% dark chocolate, a bit of sea salt and gobs of incredible caramel. From someone who fought with my siblings for the caramel chocolates inside Russell Stover boxes growing up- it's safe to say this is a chocolate lover's experience like no other. Other scrumptious flavors include peanut butter and chipotle, port wine caramel, dried apples with candied pecans and cinnamon, and a white chocolate bar with ginger snaps.